The Doubletree by Hilton - Toronto Airport hotel a Pinnacle award-winning hotel is situated moments from Pearson International Airport /YYZ/ across the street from the Toronto Congress Centre only twenty minutes from downtown Toronto five minutes from Woodbine Race Track and 20 minutes from Canada*s Wonderland. For your convenience the Doubletree provides complimentary shuttle service to and from the airport and an onsite car rental agency. Our hotel also has customer-controlled in and out parking. The Doubletree by Hilton - Toronto Airport hotel is a traditionally appointed full-service hotel that offers extensive meeting and convention facilities exceptional recreation and dining options and an advantageous location making our Doubletree Hotel the perfect choice for Toronto business or leisure travel. The Doubletree by Hilton - Toronto Airport Hotel Features From small board meetings to large conventions and trade shows the hotel*s 60 000 square feet of completely renovated flexible function space provides productive solutions for groups of up to 3 150. Doubletree by Hilton - Toronto Airport hotel offers three distinct conference centers including ballrooms and a variety of meeting or exhibit spaces. Complimentary wireless high-speed Internet in all guest rooms /public areas meeting and pre meeting space/. All meeting and banquet rooms are MeetingMatrix certified and have ISTN lines available. Our hotel*s dedicated convention services managers creative catering staff and on-site audio/visual team specialists ensure a successful event regardless of size. The Doubletree also produces lovely weddings and social occasions. 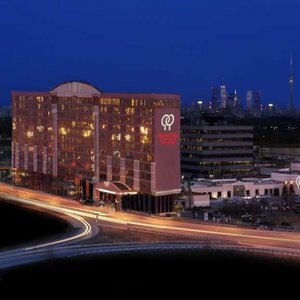 Join us at the Doubletree by Hilton - Toronto Airport hotel on your next visit to Toronto. Our friendly professional staff looks forward to welcoming you with the Doubletree Hotel*s special signature warm chocolate chip cookie at check-in.